Some would argue the future of mankind is defined by the strivers and the educated, thus making the early years an extremely important stage of everybody’s lives. The western teenager spends approximately 9 hours a day in front of a screen. This has only increased over time and is proving to have become the ‘norm’. With this much time dedicated in front of screens, it has become uncompromisingly clear that the digital medium is a key way to communicate with millennials and such. In this post we discuss some, of the multitude of ways in which Digital Signage can benefit Educational facilities. Grab and hold students attention with digital signage. 400% more views are captured with digital displays unlike their static counterpart, cutting through the copious amounts of static posters scattered around the establishment, providing messaging that is remembered. 83% of people recall seeing at least one ad or piece of information on a digital billboard (large digital signage display(s)) in the past 30 days. Presentation Displays are a clever way of keeping important information displayed at all times such as time, date or news etc whilst also displaying additional content via an HDMI input from a laptop or similar device. Integration with live data such as RSS feeds, twitter and livestreams (IPTV) can be streamed directly in to zones throughout the digital signage network, providing a current and valuable source of information. Encouraging student collaboration in which their messages can be displayed on Digital Signage and seen throughout the educational facility can be highly motivating and community-building. 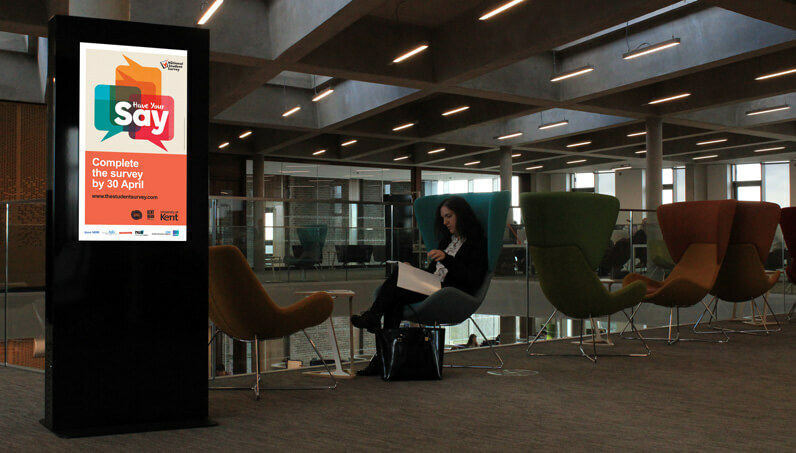 Students disrupting class trying not to announce their presence as they sneak in late, staff or visitors late for meetings, can both be vastly improved with a Digital Signage Wayfinding solution. Leaving one less excuse in their plethora. Room booking, particularly in further education is required for students to shut off from the outside world and discuss, develop and innovate without being interrupted every 5 minutes with someone checking if the room is free. A room booking solution solves this. With the ability to pre-book online via Office 365 or at reception, you can be sure the small display outside each room will clearly notify of the room being in use and the time it will be free. 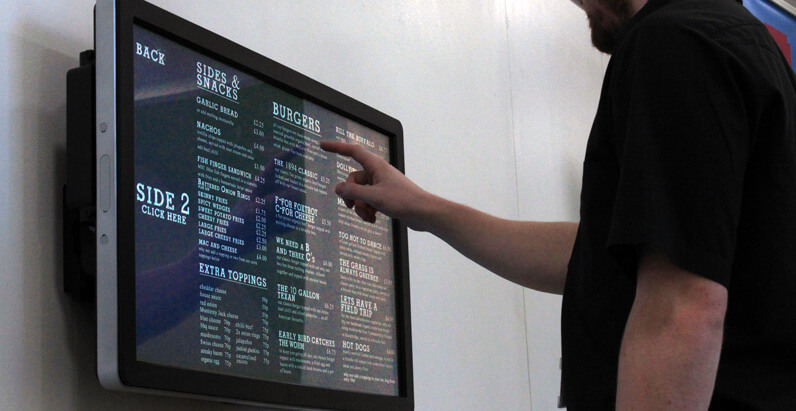 Digital Menu Boards save time and money when it comes to updating the menu or resolving a ‘typo’. Not only this, digital menu boards are also proven to increase sales by up to 30% and the chances of an impulse purchase by up to 20%. Making it a great opportunity to promote healthy eating leading to better grades. Importing travel data, such as train, bus or accident information, can make sure students and staff plan ahead and dodge any delays. Nobody wants to be late home. On any campus where food is being prepared and sold, strict EU Allergen Laws must be abided by. Allergy information boards provide and easy and intuitive solution to give students and staff detailed ‘on-the-fly’ information about any food items. This easy to update option makes for an obvious choice over their paper counterpart. Additional revenue streams can be acquired through advertising on Digital Signage. This must be carefully managed however as content must be suitable for the age of the viewers. Limitations on what can be advertised to younger demographics must be accounted for. 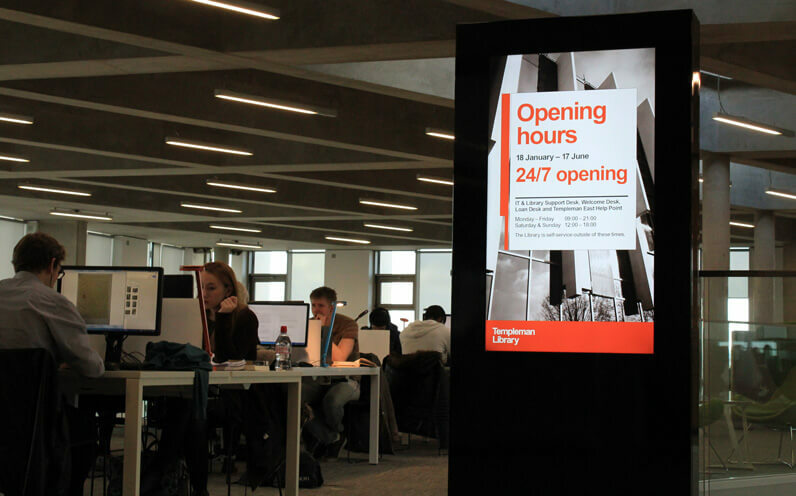 10) Promoting student achievements and giving them a voice through Digital Signage is not only motivational to them, and other aspiring students, but it showcases the establishment in a positive light for any visitors. Creating a strong and conclusive image for the school. 11) Making sure students are safe and understand evacuation procedures is of extreme importance. Digital Signage makes sure staff and pupils know exactly what to do and where to go in the event of an emergency. Displaying critical information and physical directions to exits or meeting points is important in a time of potential hysteria. This alerts can be triggered by a device controller such as an app on a phone.